This was written by Cole :Hey guys! What’s up? I’m Cole Pendery. I was born in the Great Ole’ State of Texas. I grew up and attended school in the small town of Midlothian, just south of Dallas. There isn’t much to do in a small town, so my parents signed me up to play soccer. I started playing at the ripe old age of 4. I loved the sportsmanship and the camaraderie of a team. It was then that I learned the true meaning of “teamwork.” If I wasn’t doing homework, you could find me on the soccer field. About a month after the move, I was told about an audition for the band that was being put together by 3 very influential men in the entertainment industry: Simon Fuller, Jamie King and Perez Hilton. The audition was for the band now known as IM5, and I am honored to say that I am a member of this team. But those words “band” or “team” or whatever else you can call us doesn’t really describe what we truly are. We are a family, 5 brothers living our dreams together. I feel so blessed to have these guys in my life. I can always count on them for anything. This was written by Dalton :What’s up, y’all? So, a little bit about me! I was born in Memphis, TN, but I moved to Dallas, TX with my family when I was 2. I call Sunnyvale, TX home. I have always loved music. My Grandma signed me up for my first guitar lesson when I was 11, but I got really bored just learning to play for myself, so I asked my parents to sign me up for a local rock school. I’ll never forget the feeling that I got when I was on stage for the first time. I knew it was for me. I played tons of gigs, from small clubs to sporting events in huge arenas, and I loved every minute of performing with the School of Rock in Frisco, TX. I love my family, I love my friends, and I just love life! This was written by Dana:Hey everyone! My name is Dana Vaughns, II. I’m 14 years old and originally from a small town near Pittsburgh, PA (BLACK AND GOLD ALL DAY)! Just a little bit about me… I love having fun! I truly enjoy singing, dancing, and acting. When I’m not doing those things, I love hanging with my friends, family, and playing basketball, golf, and video games. However, I know when it’s time to “work” and get down to “business”. So, as life went on, I got more serious about my craft. My wonderful parents realized my passion early on and I’m so thankful that my family had the means to move me out to L.A. It’s unfortunate that my father has to stay back in South Carolina (where I previously lived before I moved to LA), but I appreciate both of my parents. My mom is always there for moral support when no one else is there for me. Also, my mom is willing to take me where I need to go so I can exceed in my craft. Without my parents, I surely wouldn’t be in this amazing situation! As you know, I’m in a band called “IM5″ and I’m absolutely crazy about being in this band!! I mean, wouldn’t you enjoy hangin’ with 4 other dudes that feel like they’re your brothers and be able to tell them anything? I know I’m glad that I have four people in my life like that! I was born in Los Angeles, California on June 18, 1996. Music has always been a huge part of my life. I started playing the piano when I was 4. I also made the transition from screaming toddler to actual singer at one point. My parents are probably grateful for that. Then came the countless community theater productions. I was rehearsing for some show practically every weekend. After I learned what the word “cool” meant, I started to branch out into more genres of music. I love a variety of music, but my heart is in R&B and Gospel. Stevie Wonder, Al Green, Aretha Franklin and Otis Redding are just a few of my favorites. Throw in some singer/songwriters like John Mayer and Jason Mraz, some alternative rock like The Script, some retro soul like Adele and Dionne Bromfield, some old school hip hop like A Tribe Called Quest, De La Soul and Run-DMC and you have my iTunes library. Wanting to perform anywhere with a microphone led me to acting jobs in film and television. I’ve also won singing competitions and piano scholarships in Southern California. More recently, I’ve started playing the guitar and writing and producing my own songs. I never really pictured myself in a group until now. I can honestly say that being in IM5 is the best thing that has ever happened to me. It’s great to be on a team where everyone respects and supports each other. We all bring different personalities and different styles to create a unique sound that I think separates us from the other groups out there. We’re a brotherhood as much as we are a band, and I think that will play into our success as a group. Yo! What’s up? It’s Gabriel Morales. I’m 16 years old. I was born and raised in Miami, Florida. I’m Cuban and Venezuelan! I dance a little, sing a little, and act a little, but lets not talk about that! lol. My fave clothing store is Joy Rich. I have no middle name! My fave artist is Chris Brown. I don’t like scary movies…they’re scary. My fave boyband is IM5..they’re pretty awesome. I’m a Mac not a PC! My fave video game is anything batman or COD. My fave superhero is Batman! My fave TV show is How I Met Your Mother. It’s legen-…wait for it…-dary! 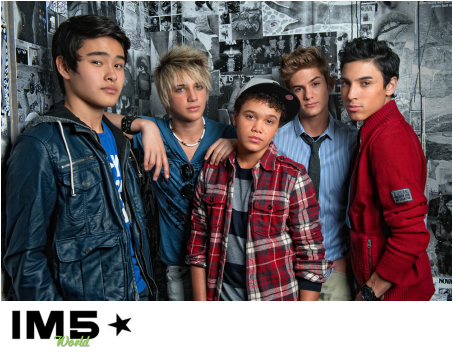 And, last but not least, IM5. My dreams for our group are out of this world and I absolutely see myself on stage with them in the near future venturing out on worldwide tours, meeting our amazing fans, and influencing people our age around the world to pursue their dreams and persevere. 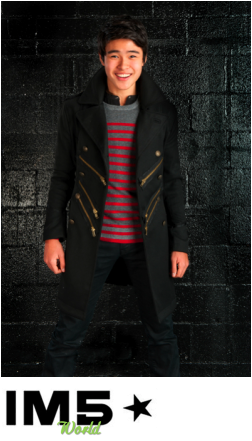 IM5 is an amazing boyband brought together by showbiz vets Simon Fuller, Jamie King and Perez Hilton. The members of IM5 are Cole Alan Pendery , Dalton Rapattoni, William ( Will) Jay , Gabriel ( Gabe Morales and Dana Vaughns. The band has already about a year together, they have vocal and dance training. They are currently working on theri debut album and fine-tuning their live performances. Stay Tuned!